The day is dedicated to exploring the city of Athens. We begin with a panoramic tour to the most important monuments and landmarks of the city including the Panathinaikon stadium, the Zappeion, the temple of Olympian Zeus, Hadrian's Arch, Syntagma square, the Parliament, the tomb of the unknown soldier, Schliemann's house, the Academy, the University, the National Library, and the old Parliament. Next we head for our guided visit to the Acropolis, including the Propylae, the temple of Athena Nike, the Parthenon, and the Erechtheion. Later, we continue with a guided visit to the Acropolis museum voted one of the best museums in the world. Afternoon at leisure to explore Plaka, the picturesque old part of the city, and why not, some shopping at Ermou street. 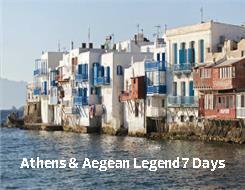 Breakfast and transfer to Piraeus port to embark on «Celestyal cruises» for the three night «Iconic Aegean» cruise. Arrival in Mykonos in the afternoon. Free time to explore the bustling town of Mykonos until late in the evening. Early in the morning you will be arriving at the port of Kusadasi. Disembarkation for your included shore excursion to "Ancient Ephesus through the Ages". Around mid-day, the ship will set sail again for a short trip to Patmos. Do no miss the optional excursion to the famous monastery of St. John and the Grotto of the Apocalypse. Arrival in Rhodes early in the morning where the ship will be docked for the whole day. During your included "Medieval" tour, we will visit the Acropolis of Lindos and the citadel of the Knights (Rhodes’ old town). Return on board of the evening. Arrival in Heraklion early in the morning. Possibility of an optional excursion to the Minoan Palace of Knossos with the legendary Minotaur. In the afternoon we will arrive at the unique island of Santorini. You can choose to take the cable car up to Fira town or follow an optional excursion to "Spectacular Oia village perched on the caldera rim". Every Saturday from March 16th until November 9th. *For departures within Greek Orthodox Easter week, please ask as itineraries may not be available or maybe altered. The 5-days/4-nights cruise to the Greek islands, with all meals, drinks package, port taxes and service charges, tips/gratuities on board, and the two above mentioned shore excursions included.